Property owners who remember the global financial crisis of 2008-2009 may be apprehensive about the road ahead for South Africa’s property market, especially since South Africa is now officially in a technical recession. Economic growth is not likely to improve much for the rest of 2018. Forecasts are slightly stronger for 2019, but this is likely to take time to play out in property markets. Homeowners are better able to navigate a recession when they prepare for it. Ups and downs are a natural part of the property cycle. In time the market recovers, and property remains a secure and profitable investment over the long term. One of the first side-effects of a recession is an increase in the Consumer Price Index. A soaring CPI makes it difficult to cover basic expenses, let alone contemplate new investments or properly maintain ones you already have. One of the best ways to prepare is to begin economising as early as possible. If you only start cutting back when you feel the pinch, it may just be too late. Saving is never easy when a recession hits. Most South African mortgage holders have prime-linked bonds. Increasing the interest rate is the primary way for the South African Reserve Bank to curb rampant inflation and stabilise the economy. Unfortunately, when inflation soars, interest rates climb, and bond repayments do too. This is why buying a little below your maximum affordability enables you to absorb unexpected rises in the interest rate. With less consumer spending and higher interest rates, less people buy property during a recession. A lack of demand often results in stagnation or even decline in property prices. In a seller’s market, buyers might be willing to spend a little more on a property, especially if there’s competition for a listing. In a recession, sellers should avoid overpricing their properties. This can result in a listing that sits for months or even years – a situation guaranteed to result in a drop in the eventual sales price below true market value. A ‘price reduced’ property is not always a bargain – it could just mean the house was overpriced and the seller is becoming desperate. In a recession, the competition is between sellers rather than buyers, with sellers all competing for a limited pool of qualified buyers. It’s important to try and list your property at the correct price from day one. This can be difficult when trying to balance your expectations and fluctuating market conditions. Property is a long-term investment. It’s a question of riding out lows to reach the next highs. The longer you can afford to hold on to a property and keep it properly maintained, the more you will benefit when the downward trend ends, and an inevitable upswing occurs. During a recession, sellers can expect to wait longer to sell a property than in boom times. Buyers are under less pressure, and they can take their time to carefully weigh up all their options before making an offer to purchase. For sellers this means that all the flaws of a property are likely to matter more and keeping a property in really good condition is a plus. 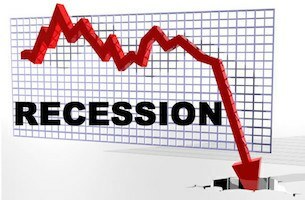 A recession puts buyers in a strong position to negotiate. With fewer buyers on the market, there is less tolerance for overpriced homes and less competition for listings. Those who are in good financial standing and have a nose for a bargain can benefit during a recession. In property, as in other economic sectors, you have an opportunity to maximise your gains during a recession while general sentiment is negative. When sentiment turns positive, prices usually move upwards quite rapidly. If you only start economising once you feel the pinch, it may be too late. When inflation soars, bond repayments climb due to increased interest rates. Buying a little below your maximum affordability helps you to absorb increases. Property is a long-term investment where you have to ride out the lows to benefit from the highs. Buyer opportunities exist during a recession.